Don\\\'t forget to buy a copy out in bookstores and newsstands this week. 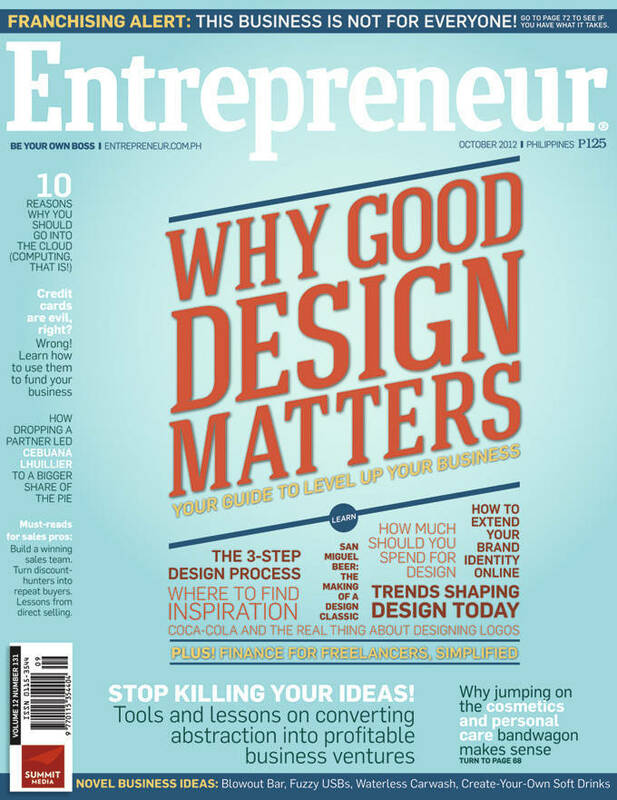 In this issue, find out the importance of good design not just for looks but as an integral part of your business strategy that will make you stand out from the rest. As a businessowner, get tips on how much you should spend for company design and how you can improve brand identity online. Diego Rodriguez, Entrepreneur-in-Residence at Harvard Business School says that entrepreneurs must look at design as, "a way of approaching challenges which designers and non-designers alike can learn to use to create positive change in the world." For the budding creative freelancer, we outline the important financial concepts that he must understand. This includes the monetary value of time, opportunity cost, royalties and cash flow. On the other hand, if you are looking for new business opportunities, we also highlight the advantages of getting into the cosmetics and personal care industry. These are bestselling products in the country that complement the Filipino habit of always wanting to smell and look good. Don\\\'t forget to buy a copy of our September issue out in bookstores and newsstands this week. You can also download past issues here.